We Got Invited Over for Dinner! And my friend Christy is still alive to tell about it! 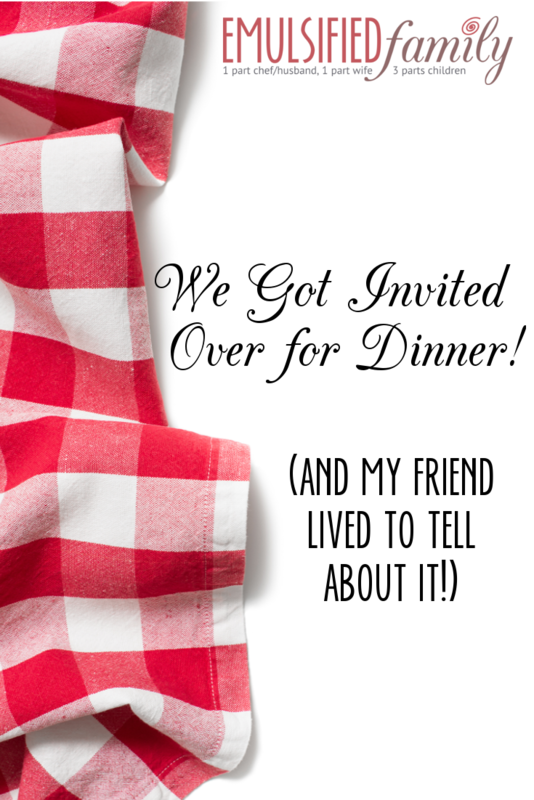 I joked in this post about how we never get invited over to people’s homes for dinner because people are scared to cook for my chef/husband. But last month, it actually happened! We went over to a friend’s house for dinner, AS A FAMILY!! The last time this happened was . . . well, let’s just say it’s been a while. My friend seemed calm and relaxed the entire evening. See? It’s really not a big deal. If you still think it is scary and you are stressing about having a chef over for dinner (or even the chef’s wife – oh my . . . why would someone be nervous to cook for me?? ), please read this. I promise you will survive. Anyone else have friends who are afraid to cook for you or your chef? Tell me about it in the comments below! yay! I’m glad you had a wonderful evening. I am working on “letting go” a bit of my anticipation of other people’s expectations and trying to embrace hospitality more. It is one of my 2015 goals.